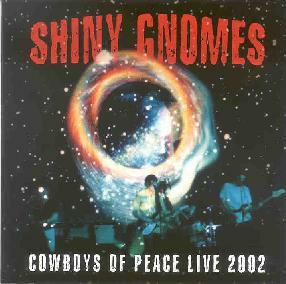 Shiny Gnomes - "Cowboys Of Peace Live 2002"
This is a very long standing psych-folk rock band from Germany dating back to 1986. This is their very first live release and features a wide range of styles from a lot of the records but the majority of the songs come from the Wild Spells CD from 2001. The CD opens with "We Grow" from the 1993 Orange LP. A powerful opener, reminds me a bit of Spiritualized. The faster paced songs like "Resurgent Mind" fit very much into the UK psych pop sound. Good stuff. A few older songs from 1987, "Funny Nightmares" and "Lazing At Desert Inn" are also included. "Lazing At Desert Inn" is a great 11 minute spaced out song showing the band experimenting a bit and going out into space. The CD ends with a few rare and unreleased tracks like "Papergod", which is loosely based on a Bo Diddley riff. "Tripping Mind" is a more 60's inspired rocker. The CD ends with "Half Blues Half Artefact" from the 1990 Colliding LP. Overall, an excellent collection of the bands material and a good place to start if you have not heard any of their previous music. For more information you visit the Shiny Gnomes web site at: http://www.shinygnomes.com. Cowboys Of Peace Live 2002 is distributed by Sireena Records. You can visit their web site at: http://www.sireena.de. Contact via snail mail c/o Sireena Records; Postfach 1148; D21707; Himmelpforten; Germany.